We all know sugary and fizzy drinks can wreak havoc on our health, and they are found everywhere. From TV commercials promoting diet soda to the enticing menu presented to us at our favorite restaurant, artificially sweetened drinks lie everywhere. The good news is there are healthy drinks out there, even if healthy beverage options may seem limited. Thankfully, there are many more healthy drinks for you to choose from than you might think — so you won’t go astray from your health goals. 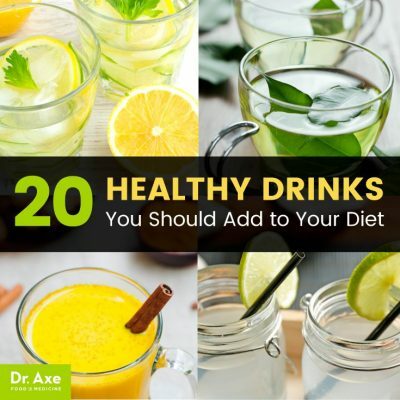 These beverages can not only do your health great favors, but can spice up your palette so you won’t grow bored and throw in the towel to living a healthier lifestyle. So what are the top 20 healthy drinks around, and what makes them so healthy? I’m glad you asked. Dandelion tea is near the top of the list of healthy drinks due in part to its place among the best detox drinks as well. If you’ve ever gone outside to gather stinging nettle leaves by mistake with your bare hands, you know it feels like you’re being attacked by a group of angry bees. Ouch! Despite it being painful to the touch, this underestimated plant is a powerhouse of benefits. Stinging nettle is beneficial as a liver tonic and rejuvenator. It has supportive effects on circulation, the immune system, urinary tract, nervous system, respiratory tract, digestive tract and endocrine system. Its high magnesium content may be the reason for nettle tea’s ability to reduce leg and menstrual cramps. Turmeric has been rising quickly in popularity worldwide, especially the golden milk drink. Curcumin is one of the main active constituents in turmeric that gives it its benefits. It is commonly combined with bromelainor black pepper for increased absorption and anti-inflammatory properties. Turmeric has been long used in the Chinese and Indian medicine as an anticancer agent, protecting against wide variety of conditions, including Alzheimer’s disease, toothaches, rheumatoid arthritis, sprains and wounds. Thanks to the benefits of raspberry nutrition, red raspberry leaf tea joins the list of healthy drinks. Parsley is a fairly small Mediterranean herb that leaves a nice presentation on your plate. Drinking parsley juice can decrease the risk of cancers, such as breast, prostate and skin cancer. The high amount of flavonoids, known as apigenin, makes it a strong antioxidant and anti-inflammatory herb. Folate in parsley encourages cardiovascular health by reducing pro-inflammatory homocysteine, and parsley offers protection from an extensive selection of disorders, including asthma, atherosclerosis, diabetes, colon cancer and more. Blueberries are an excellent choice to add to your diet because they not only taste great, but they have the highest antioxidant capacity of all fresh fruit. Blueberry drinks improve glucose control and decrease blood cholesterol, lowering the risk of heart disease and diabetes later in life. Anthocyanin, an antioxidant found in blueberries, is a very effective immune builder and antibacterial agent to prevent infections. Kefir is a probiotic drink that provides that healthy gut bacteria. It, along with other probiotic drinks, promotes efficient digestion by achieving a healthy gut flora, fighting against pathogens and boosting energy levels. Probiotic drinks are “pre-digested” as the sugars in the beverage have been broken down, making them easier to digest creating less work for the pancreas which secretes digestive juices. In Ayurvesda, holy basil, or tulsi, is known as “the queen of herbs” and is recommended for conditions such as fever, cough, arthritis, ringworm, and insect, snake and scorpion bites. It’s a potent adaptogen, which are herbs to help your mind and body cope with physical and emotional stress. Like kefir, kombucha is a fermented, probiotic drink that does wonders for your health. It’s been shown to help prevent disease, support a healthy gut, potentially improve mental state, benefit the lungs, fight bacteria, manage diabetes, support heart health and maintain a healthy liver. When you drink healthy beverages, you get more of the nutritional value because they are in their liquid form, making it easier for you to digest and absorb nutrients. Your stomach won’t have to work as hard to break the food down and pull out the nutrients you need. Liquids skip the chewing process, and the beverage reaches your digestive system at a faster rate. Although drinking clean pure water alone is great in most cases, it doesn’t contain high levels of electrolytes and minerals to replenish what was lost during times of illness and strenuous exercise. Since the healthy drinks are at a liquid state, they can be easily digested, making the electrolytes and vitamins easily accessible to help avoid electrolyte imbalance. People lack the enzyme L-glucono-gamma lactone oxidase required for the proper synthesis of vitamin C; hence, they must acquire it from natural sources, such as healthy drinks that contain citrus fruits, green leafy vegetables, strawberries, papaya and broccoli. Traditionally, vitamin C foods and drinks were carried by sailors on long journeys to avoid scurvy, a disease of bleeding gums. When it comes to soft drinks, they rank the top of the list of being the most unhealthy beverage out there. With tons of sugar and no nutritional value, soda can put you on the fast track of gaining weight, overeating, being dehydrated and developing dental caries. Do some spring cleaning for your health by going on a Beet & Berry Liver Juice Cleanse. Add a healthy drink to your beauty regime by trying out Hot Pink Beautifying Juice. Switch out those sugary and caffeinated energy drinks by sipping on Red Spark Energy Juice to give you a healthy energy boost. Replenish those electrolytes and quench your thirst by replacing your commercial sport drink with Strawberry, Watermelon, and Cucumber Juice. You can also try my Hydrating Watermelon Smoothie Recipe with Strawberries and Banana, Watermelon Agua Fresca Recipe, Secret Detox Drink Recipe and Healthy Smoothie Recipes. If you are prescribed medication, you should not use curcumin or turmeric without first talking to your health care provider. Turmeric drinks may interfere with the action of blood-thinners, diabetic drugs, or NSAIDS. Dandelion drinks should be avoided when having conditions such as bile duct obstruction, acute gallbladder inflammation, acute gastrointestinal inflammation and intestinal blockage. Unhealthy drinks maybe shelved everywhere at your favorite grocery stores and restaurants, but healthy drinks are up and coming in popularity because many are taking an active role to better health. There are a large variety of dark green leaf, organic fruit, tea and dark chocolate drink recipes that are not only delicious, but provide you with heaping health benefits. If you want to improve your skin, go on a detox, replenish your electrolytes, healthy teeth and gums, and better digestion, healthy drinks will do the trick. Unless you are juicing and making smoothies on your own, it is important to look at the nutritional value labels to ensure you are getting most of the fruit and vegetable and not purchasing drinks filled with sugar and artificial flavors. If you were prescribed medication, consult your health care provider before consumption of some of the ingredients in healthy drinks as they can interact with your medication.